Enrolling now for 2019 International Day and Evening classes. 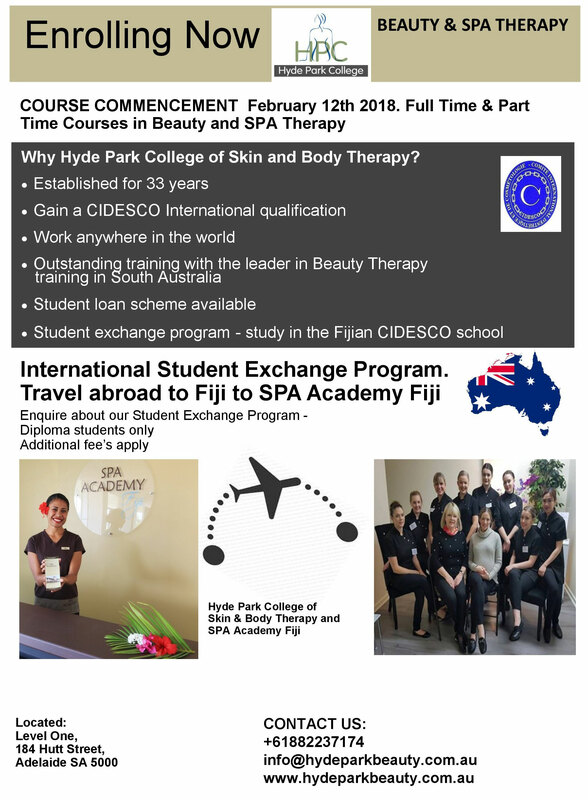 Contact the College on 82237174 or info@hydeparkbeauty.com.au for more information. 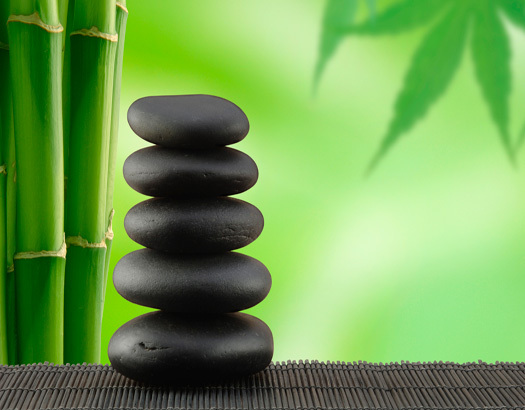 Lithos therapy uses heated & chilled marble rocks as therapeutic instruments to enhance & prolong the benefits of health & beauty treatments for the body, face, hands & feet. Therapeutic use of heated & chilled rocks. 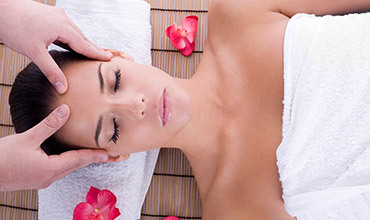 I am delighted that you are interested in a career in International Beauty Therapy and hope you will find the following pages interesting and informative. I am proud of what we can offer you in training at the Hyde Park College of Skin and Body Therapy and assure any applicant that my staff and I will provide a high standard of training and expertise which will ensure the success of our students. Many of our trainees and past graduates are now employed in Aquavit, Endota, Janesce, Jurlique, Coco’s etc. Hyde Park College can now offer on campus Boarding facilities for interstate and country students. 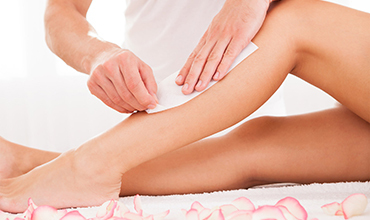 Call us now on 82237174 or email us info@hydeparkbeauty.com.au for more information. I graduated from Hyde Park College of Beauty Therapy nearly 20 years ago. I enjoyed every minute of it, even when exams were fast approaching. The support and knowledge from Dianne and her trainers was world class. They instilled in me a wonderful work ethic and an extremely high level of professionalism, preparing me for the workforce. My international qualifications opened doors that I would never have dreamed of. My CIDESCO certification enabled me to work in London for various salons, even having the opportunity to treat some famous faces!! Even now, many years later, I am still doing regular treatments for friends and family members. I would highly recommend Hyde Park College of Beauty Therapy to anyone who is thinking of pursuing a career in Beauty Therapy. Your education at the college will ensure a successful, opportunity filled career. I have been a Massage Therapist for 4 ½ years and began my career by gaining employment at Day Dream Island SPA in the Whitsundays which I really enjoyed. After leaving Day Dream Island I returned to Adelaide and began applying for a few SPA positions. Unfortunately due to only having massage therapy qualifications I was not as successful as I would have liked. 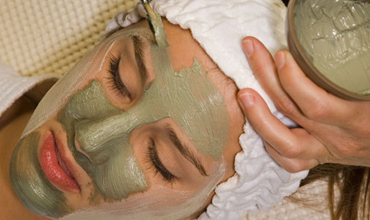 It was then I decided to look into the Beauty Therapy side of training to increase my job prospects. 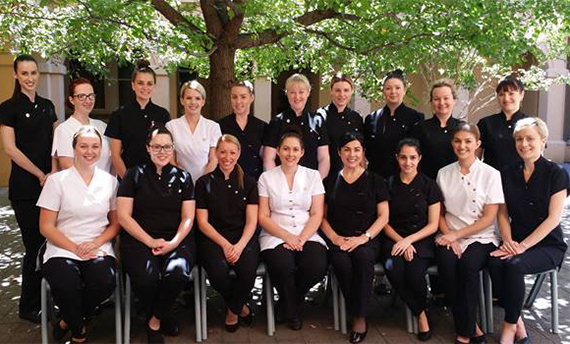 After looking at training at a few different Adelaide colleges I chose HPC of Skin and Body Therapy because of the International accredited diplomas they offer and also because of their reputation for solid Beauty and SPA therapy training. I was a bit tentative at first wondering what I had gotten into but quickly got into it and really started to enjoy it. When not studying at the College I am in part time employment in the Beauty and SPA Industry because of my International Beauty Therapy qualifications. To be the best is never an easy road. I attended Hyde Park College in the year 2000, when we had the white dresses with the lovely orange sashes! That year was an amazing year for me, I made so many life long friends whom I see still now, and I sat the CIDESCO exams and achieved highest practical marks, which I was very proud of. I have had a fantastic career in the beauty industry, learning from some wonderful people. I am now a mother of two and still working in the industry but now part time, it is such a fantastic industry to work in, continually challenging and pleasing to be helping people look and feel better. 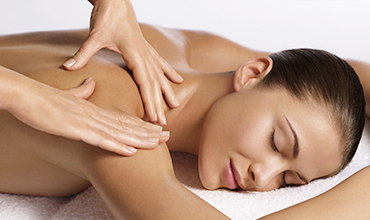 The reason I chose HPC of Skin and Body Therapy for my study is because I'd heard about the extremely high standard of the graduates and also that if my resume had HPC on it I would be chosen above any other beauty therapists looking for employment. And it turned out to be true because recently I begun looking for employment well before I have completed my Long Distance Learning course and my first choice of workplace offered me a job the day I walked in. I have been working at Isis Day Spa and Salon in Port Lincoln since February and it's nice to be able to start a new job with confidence and plenty of knowledge. I would recommend the college to anyone and everyone who is looking for employment in the Beauty and SPA industry and for me it was worth the long drive! I graduated from Hyde Park College in 2002. My year of college was an absolutely fantastic year not just because we were studying for our careers but because it was great environment. We had a lot of fun but it was also very challenging and interesting. At the time I wasn’t aware how much the industry had to offer or how far it would take me. It has been more than I expected. As a CIDESCO therapist I have been fortunate enough to work on a cruise ship through the Caribbean, live and work in London for two years and travel throughout Europe. Dianne was a great help in securing my position on the cruise ship which although very hard and challenging made me the therapist I am today and opened up so many other doors and opportunities. I have worked in many exclusive resorts off the Australian coast including Hayman Island, Bedarra Island, Dunk Island and in the centre of Australia at Uluru. I am now the Spa Supervisor at Cradle Mountain Lodge, Tasmania. Hyde Park College © 2015 All Rights Reserved.